This is a guest post by Price Dickson, a first-year veterinary student at the University of Illinois. You can connect with her on LinkedIn or comment below with any questions. 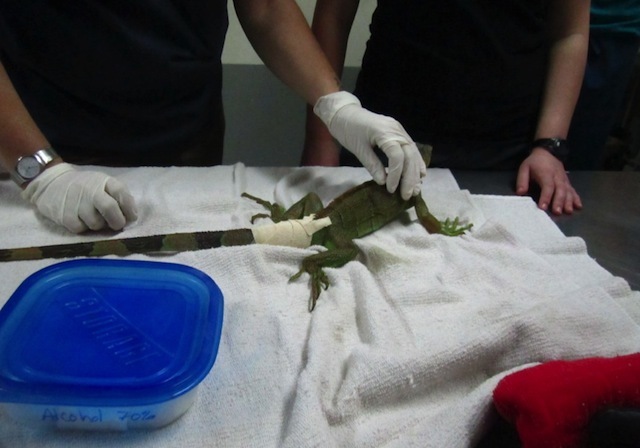 I participated in the Belize Wildlife and Referral Clinic’s Wildlife Medicine and Conservation Program this past January. The program is taught by Dr. Isabel Paquet-Durand, a veterinarian who started the clinic as the country’s only animal hospital for native wildlife. The program is well-rounded in the types of animals you get to interact with, as the clinic sees a wide range of pets and native wildlife. It also provides a great way to experience a side of the country tourists do not often get to see. The program provides a packed schedule. Clinic days usually begin early at the hospital, when we learned about their current patients. Students get to perform all the necessary treatments, with supervision as needed. Each day tries to follow a theme with trips and labs being related to the major topic being covered: reptile medicine, conservation issues, wildlife capture and restraint, etc. Information is presented in both lectures and interactive labs. 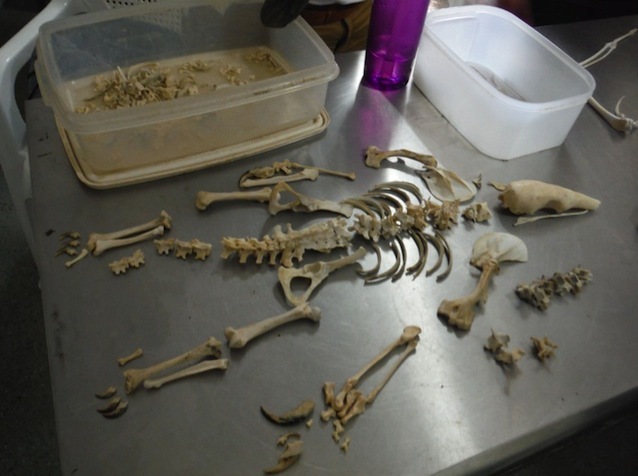 The labs are sometimes activities to familiarize students with local wildlife, such as assessing x-rays or identifying species based on skeletons or photographs. Often they are opportunities to assist with performing clinical procedures such as necropsies, blood work, or parasite screenings on patients. Everyone is able to participate in activities to their comfort level. I did a complete necropsy on a parrot and reported my findings, while students who had already been through surgery classes were given the opportunity to complete spays during the clinic’s spay and neuter day. The schedule is subject to change based on the clinic’s caseload, but I wasn’t going to complain about a lecture being cut short due to a new patient’s arrival! Most days include some kind of field trip. We visited and were given tours of the Belize Zoo, the Green Iguana Project, the Belize Bird Rescue, and the Community Baboon Sanctuary. The day trips were very interactive, and the facility we were visiting usually had some kind of project that needed to be done. These ranged from moving wild parrots between enclosures to soaking shed skin off of baby iguanas. There were trips to places that were less medically relevant as well, such as the Belize Botanical Gardens, which let us get out of the vet mindset and enjoy the real beauty of this country. Our last two days were spent on Ambergris Caye, a resort town with excellent beaches. Here we were able to go snorkeling, go on a crocodile spotting and tagging trip, and visit WildTracks Manatee and Primate Rescue. The trips provided a really good overview of everything Belize has to see in terms of their native wildlife and the work being done to preserve it. They also provided opportunities for hands-on experience. A recurring theme during the trip was the importance of working with local people to conserve wildlife. I learned nearly as much about Belizean culture, history, and livelihood as I did about medicine. I learned lot about not only the challenges facing wildlife conservation in Belize, but also the challenges facing the people that live alongside these threatened and endangered species. This is a good trip for inexperienced travelers. All of the housing and transport between activities is included; as soon as you get in the country you are taken care of. The accommodations are dorm-style and are located in Santa Elena. This is a residential area a short walk across the river from San Ignacio, which is the more commercial town with stores and restaurants. The towns are in rural Belize near the border with Guatemala, so you’re far from the typical tourist traps. Evenings are considered free time. We were free to either cook dinner with food from the local fresh market or one of the small dry-goods grocers in town, or go out to dinner at a local restaurant and explore the area. The food was amazing, with a large amount of fresh fruit available at all times and plenty of unique local dishes. (Be sure to ask about the difference between beans and rice, and rice and beans!) The official language of the country is English (although many locals speak Kriol at home) so communication is never a problem. All of the people I met there were friendly and inviting. The driver became our guide and part of the group, and he was with us for our whole time in Belize. The people working in the rescues and zoo were very welcoming and accommodating, and there were plenty of opportunities to ask questions and have in-depth conversations about issues in Belizean wildlife conservation. By the time we left, we all considered the people we were working with to be friends. Probably the only downside to this trip was the cost. The whole program cost me around three thousand dollars, including airfare and evening meals. I spent ten days there, but they do offer longer programs during the summer that are more cost-effective. Every rescue visited is paid for their time, which helps fund the work of rescuing and rehabilitating wildlife. The Belize Wildlife and Referral Clinic (BWRC) itself is partially funded by this course. So while expensive, the program helps to maintain the wildlife of the most pristine forests in Central America. Organized directly through BWRC, there is no middle-man or internship planning service to pay; all of the money goes directly to the people working to rehabilitate Belizean wildlife. If you want to see just about everything Belize has to offer, gain some valuable experience working with tropical wildlife at a non-profit animal hospital, and also help to fund the tireless efforts of people working to preserve the country’s natural resources, this is an excellent experience. Applying is easy, and the deadlines are clearly marked on the BWRC website. You’ll also find a really good summary of the planned activities for each course session. Justin Ford (the course coordinator) is easy to contact by e-mail and is happy to answer any questions. 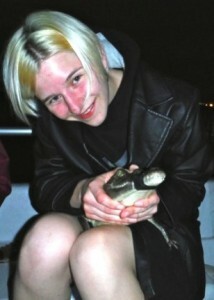 Elliott here again: Thanks very much to Price for sharing about her experience in Belize! I’ve been a fan of the BWRC on Facebook for a long time. I know that it can be tough to make decisions about which programs to apply for and how much to spend, so I think these personal accounts are really helpful. Please get in touch if you would like to write a guest post about an experience you’ve had. So what do you think? Does this sound like a worthwhile program for veterinary students? Have any of you participated in something similar elsewhere in Central America or around the world?